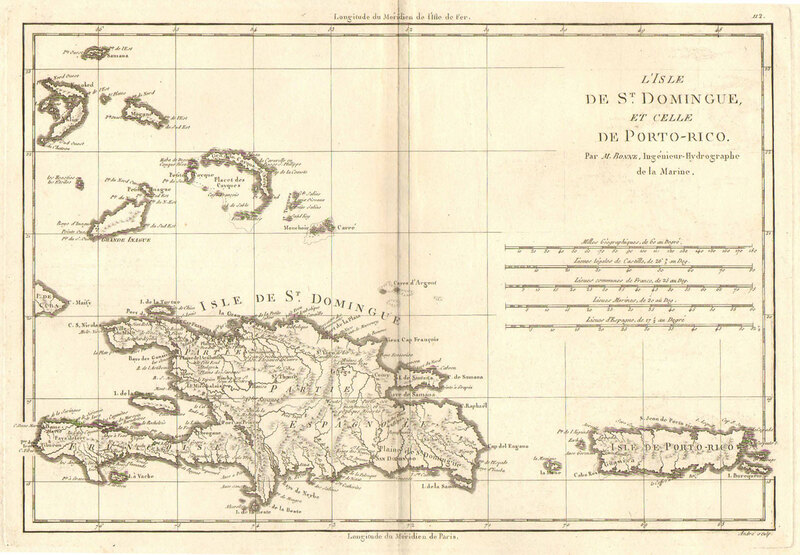 Below is a list of my stock of old and antiquarian maps and prints of Haiti for sale. Please note that images show the items with margins cropped to keep file sizes small. If the actual item has closely cropped margins this is noted in the description. Postage and packing is extra but is usually less than £6 even for overseas orders. You will receive an invoice from me showing the actual cost of postage before you can make payment. GRIMSTON FAWKES Lionel Port au Prince, Haiti. Watercolour on paper, two sheets joined at centre. Fine. 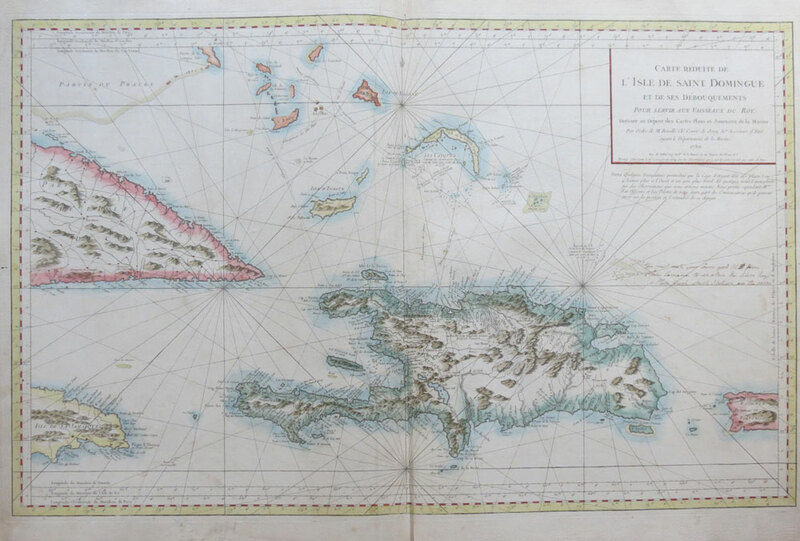 14 x 5"
BELLIN Jacques Nicolas Carte reduite de L'Isle de Saint Domingue et de ses debouquements. - Pour servir aux vaisseaux du Roy. Dresse au Depost des Cartes Plans et Jounraux de la Marine. Par Ordre de M. Rouille Chr Compte de Jouy &ca Secretaire d'Etat ayant le Department de la Marine. Hand coloured engraved chart with wide margins in fine condition. Contemporary manuscript note in ink at right warning sailors to avoid Cape Samana. 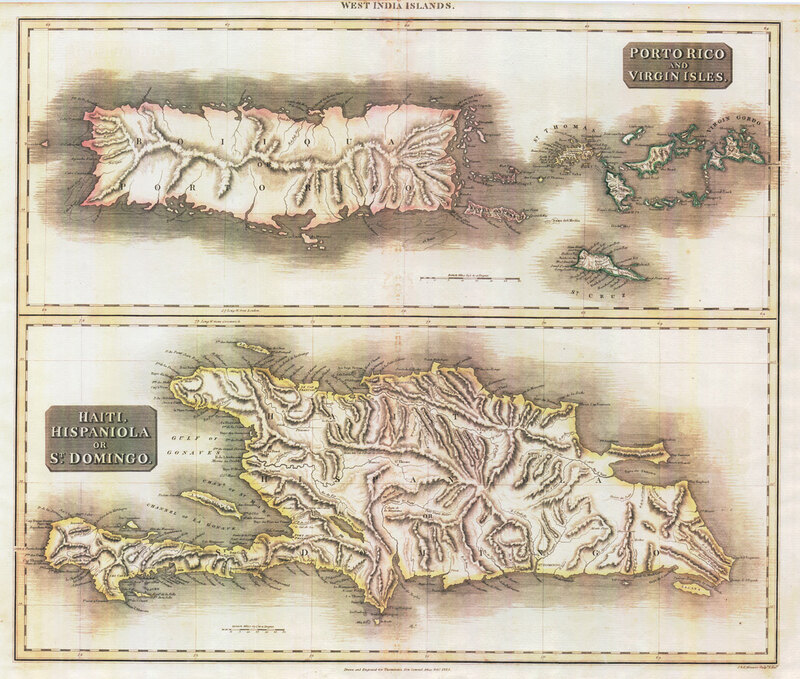 35 x 22"
THOMSON Porto Rico and Virgin Islands. 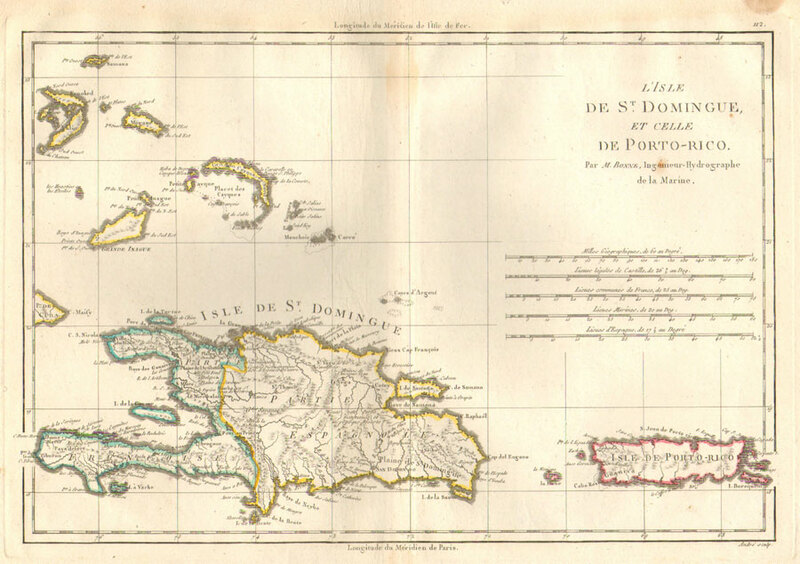 - Haiti, Hispaniola or St Domingo. Two large engraved maps on one sheet with hand coloured outline. Very fine condition. 59.5 x 49 cm. 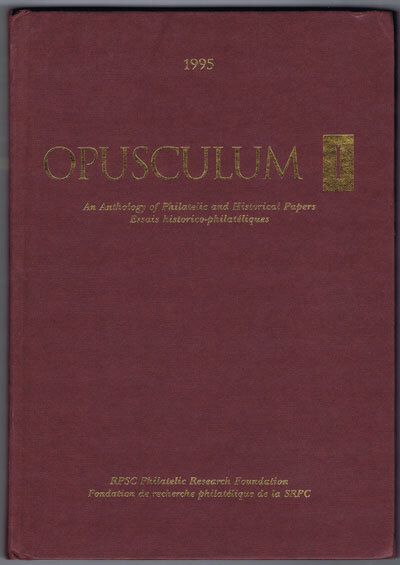 KRAEMER James E. Opusculum 1. An Anthology of Philatelic and Historical Papers. Essais historico-philateliques. RPSC Philatelic Research Foundation, Ottawa 1995 197pp. 1st ed., fine in original cloth. Diverse range of philatelic articles including Postal History of British Niger Coast to 1900 by Ince, two articles on the Falkland Is. and Haiti's first airmail stamps by Burton Sellers. JEANNOPOULOS P.C. Images of Port au Prince New York 2000 x + 102 large pp. 1st ed., fine in pictorial card covers. 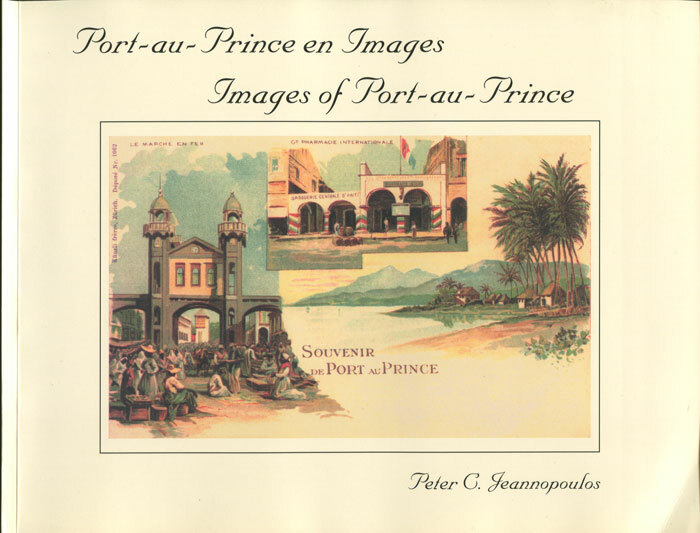 Enlargements of old picture postcard views of Port au Prince with historical descriptions. 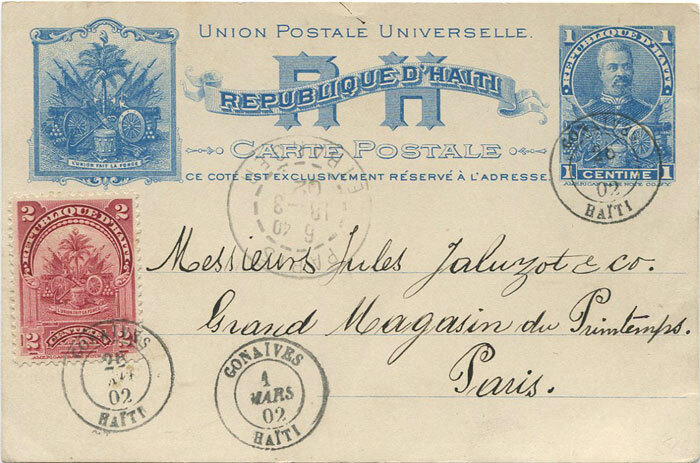 11 x 8.5"
1902 Haiti 1c postal stationery card used to Paris with added 2c tied by GONAIVES cds. Very fine. PHILIPS Anghelen A. 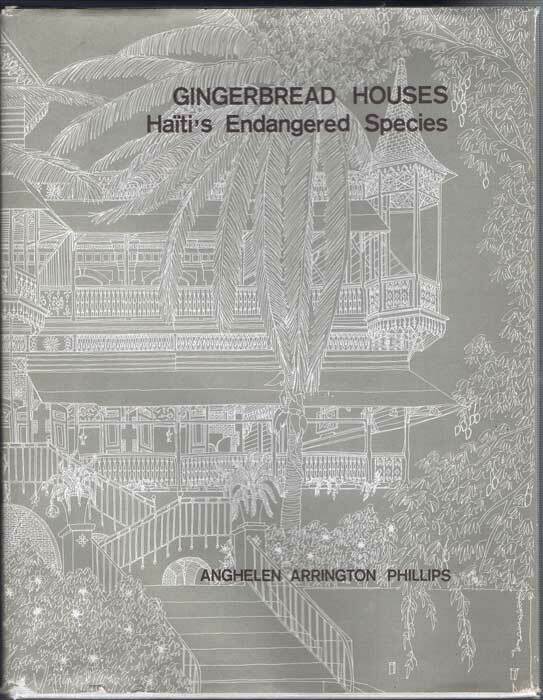 Gingerbread houses: Haiti's Endangered Species Impr. H. Deschamps 1975 93 large pp. 1st ltd. ed., no. 1598 of 2000 copies, signed and inscribed by author. Clean in very good D/W. Many fine line drawings of houses.